Our ceramic Oil Warmer Nightlights are the perfect compliment to our Body Relax Aromatherapy Oils. Plug-in and enjoy your fragrance of choice with the added ambiance of gentle illumination. No need for tea lights with open flames or a long cord, plugs directly into electrical outlet. 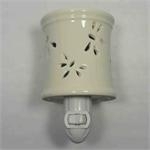 Ceramic Aromatherapy Oil Plug-in Burner Night light.